Have you noticed these historic plaques around town? The Ridgefield Historical Society proudly maintains the local Museum in the Streets heritage discovery trail and we are running a selfie contest on Saturday, July 21, from 10 am to 4 pm, in celebration of SummerFest 2018. Take a photo of yourself (and family and friends) with a plaque at ten or more locations and the first 25 participants will win a $5 gift card donated by Deborah Ann’s Sweet Shoppe! All participants will be entered to win the grand prize: a one-year $100 Family Sustainer membership to the Historical Society. Visit our tent at SummerFest (location will be announced a few days before the event) anytime between 10 am and 4 pm, show us your pics, and be one of the first to receive a gift card. To find all 30 of the Museum in the Streets locations click HERE to download the map, pick one up at the kiosk at the corner of Main Street and Bailey Avenue or the Branchville Train Station, or stop by Deborah Ann’s Sweet Shoppe or the Historical Society during public hours (Tuesdays, Wednesdays, and Thursdays from 1 to 5 pm). Gift cards are limited to one per person or family. Please note that by submitting your photos you agree to allow the Historical Society to use them for marketing and promotional purposes. For more information, call 203-438-5821. 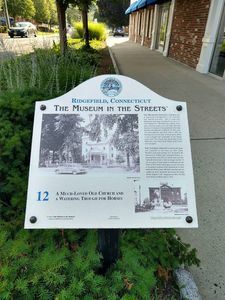 Founded in 2002, the Ridgefield Historical Society’s mission is to preserve, interpret, and foster public knowledge of Ridgefield’s historical, cultural, and architectural heritage at both the Scott House and Peter Parley Schoolhouse. Please visit our recently revamped website at ridgefieldhistoricalsociety.org. Special thanks to Deborah Ann’s Sweet Shoppe for their generous donation.